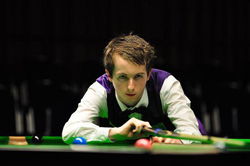 Fair City snooker ace Scott Donaldson is preparing for a high profile World Snooker Tour Scottish debut. And PA Sport is offering readers a chance to cheer on their favourite in an easy to enter competition for five pairs of tickets for the weekend action courtesy of World Snooker . The Perth potter shares the venue with some of the world’s greatest snooker players, including four times world champion John Higgins, former world champion Neil Robertson and world number two Mark Selby, as well as legends like Jimmy White and Steve Davis. The event takes place at the 600-seater Ravenscraig Regional SportsFacility in Motherwell from December 14-16. It will be the fifth tournament on the new Betfair European Tour, part of the Players Tour Championship series. Scott (18), whose career has been supported by Tayplay and parents Hector and Sheila, is making his professional debut on home soil having secured the European amateur championships in Latvia earlier in the year. That bagged a two year passport into the pro ranks. It was just 11 years ago that his dad bought Scott a four-foot table to give him a taste of the game and he had graduated to a full-sized table at 10. Scott’s travels since turning pro in the summer have taken him to Belgium, Bulgaria and Germany, in addition to events in England. He also travels to the Locarno in Edinburgh every day from his Perth home to put in the hours on the table. To be in with a chance to bagging a brace of tickets simply tell us where Scott won his European amateur title.